On a recent trip to London, I bought myself a cute skirt labeled “milkmaid skirt”. Not really sure why, as this would be close to the most impractical thing to wear while milking a lactating animal, but cute nonetheless. I decided I had to copy it in little girl sizes. The following is a tutorial to help you copy it too. Caution: this tute is extremely image-heavy. I’m not good at describing things, so I took a ton of pics. Please leave a comment if there is any confusion. Step 1: You will need to draft yourself a pattern. First, we’ll make the skirt front. Your “A” measurement will be the desired length. 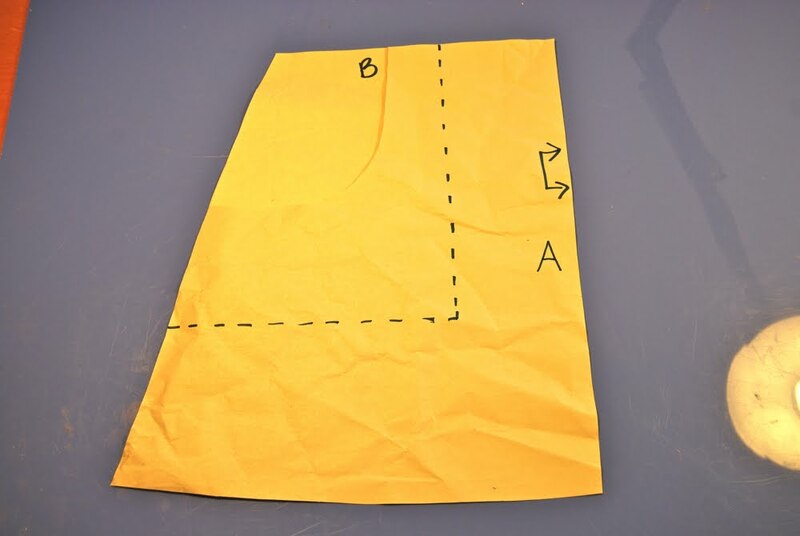 You do not need to allow for seam allowances because we will be using bias tape to hem and adding a waist band. If you wish to make a traditional hem, add 1.5 inches. 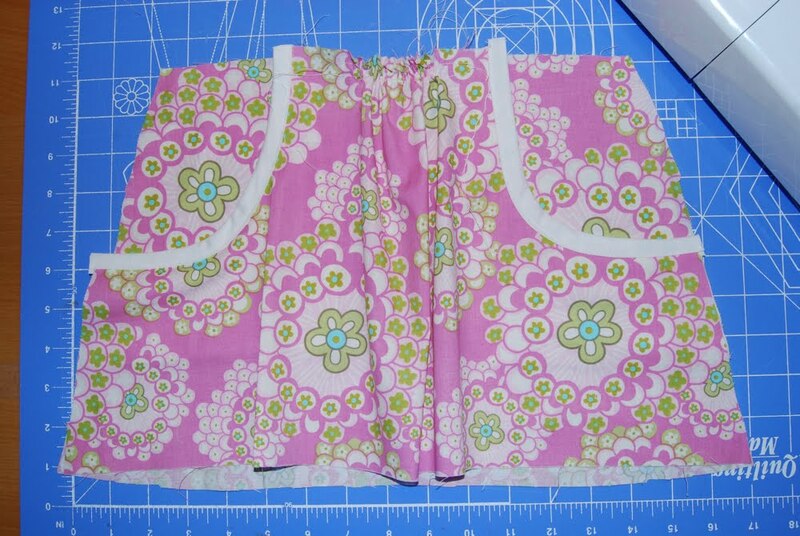 Please note that if you are making this skirt for a toddler, the waistband will probably hit under their tummy bump. If you measure the length from their belly button, your skirt will end up way too long. Keep this in mind when measuring for the waist as well. Your “B” measurement is around the waist, divided by 4, plus 1.5 inches. 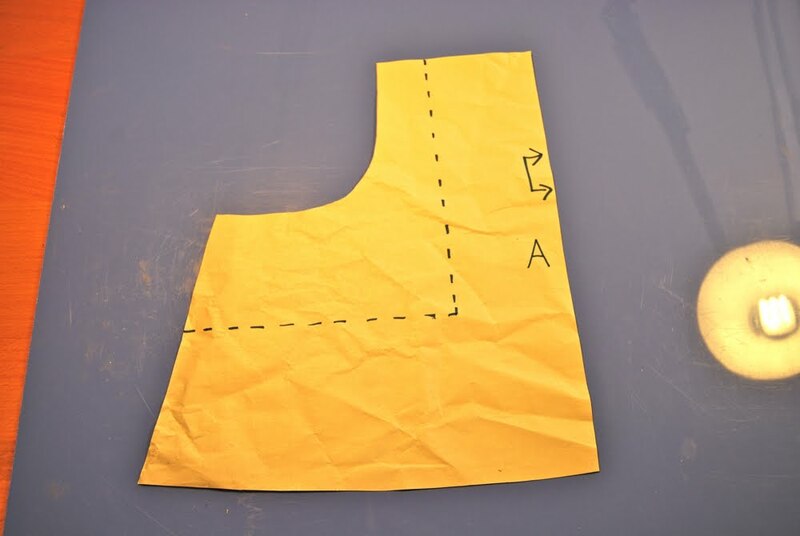 Using those two measurements, construct a pattern piece similar to the picture below. 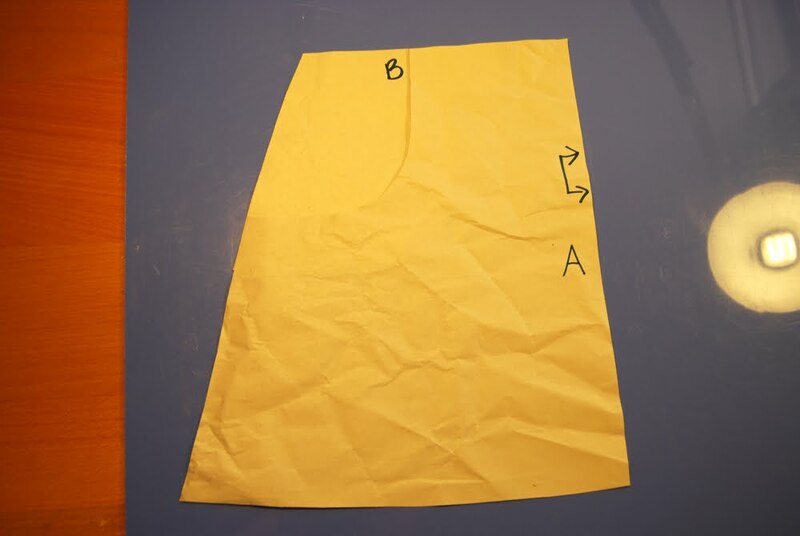 For the outer edge of the skirt, draw a slight a-line shape, but remember that it doesn’t need to be very pronounced or the skirt will be very wide. The skirt I made using the pattern below ended up a bit too wide, if that gives you any indication. For the next few pics, please ignore that little piece cut out of the top. I got ahead of myself, as usual, when taking pictures for this tute. The arrows on both the front and back indicate where you should put the pattern on the fold of the fabric. At this point, you will want to take another piece of paper and trace that little rectangular-ish piece you just made (outlined by the dotted line). You’ll see why in a second. Step 5: Let’s sew! Finally, right? 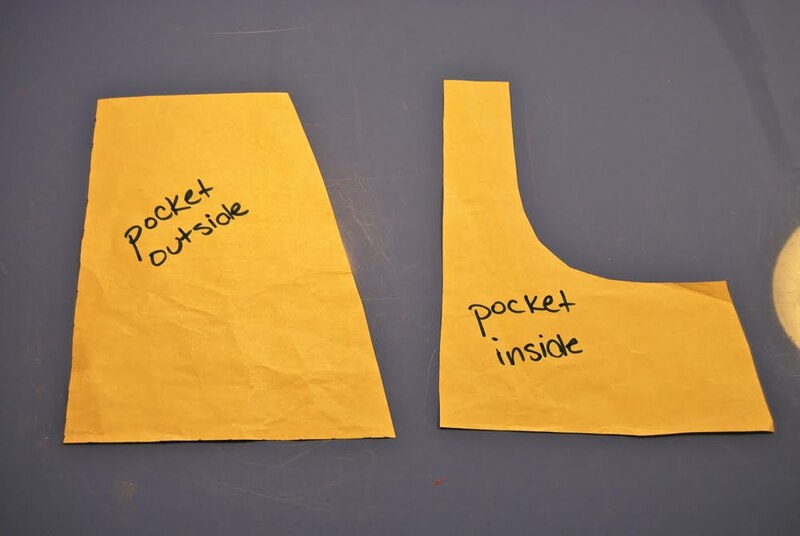 First, attach the pocket inside to the pocket outside by sewing right sides together along the edges that were indicated by the dotted line. You can click on this picture to make it bigger. I used a zig-zag stitch on top of my straight stitch to reinforce the pockets, as my 3 yr old enjoys collecting rocks. If you have a serger you won’t have to do this (and I am jealous of you). Now you will use one of the shorter lengths of bias tape to attach the curve of the skirt front and the curve of the inner pocket. Use lots of pins to force that bias tape to bend to your will. Now let’s take a moment to familiarize ourselves with the stitch that will make sewing easier, neater, and more professional in appearance. See that little symbol next to the “2” button? That is my best friend. That little guy takes the needle and does a little side step so that the needle will come down at the very edge of the presser foot. He allows you to accurately sew as close to the edge as possible. I thought I was just a terrible sewer who could not sew a straight line to save my life until I met this little hero. You should always use him to do seams, edges, and attach bias tape. 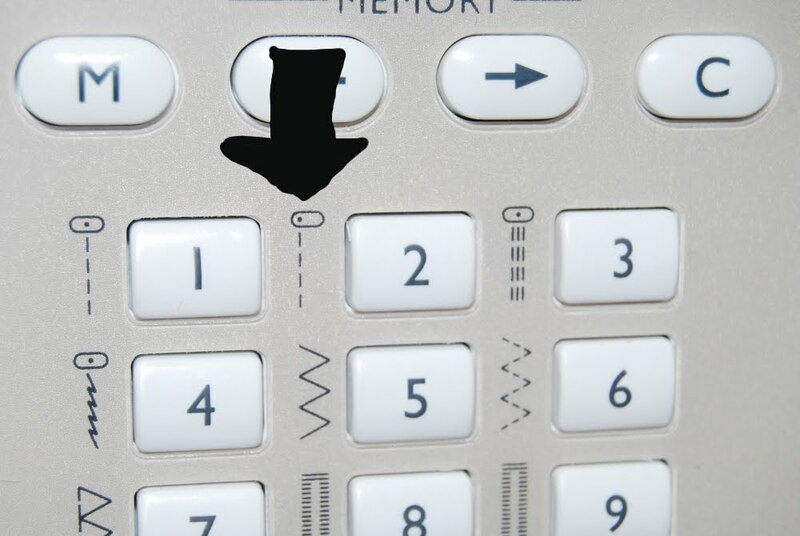 If your machine is even slightly fancy, it will also have a “reverse” or “mirror” button that will make the needle switch over to the far right side, so you don’t even have to turn your fabric around. Awesome. Ok, let’s get back to sewing, shall we? 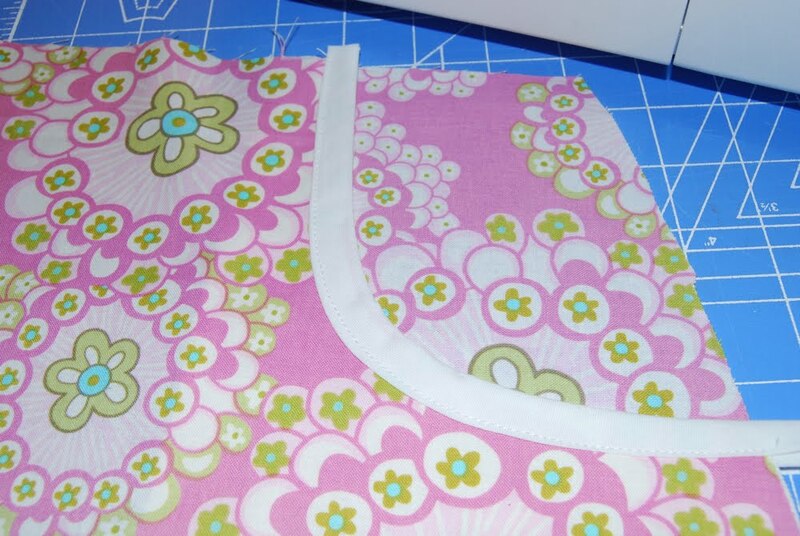 Use that handy little stitch to attach the bias tape to the curve, and voila, you have a pocket! Now do all that again for the other side. Pull the threads until the skirt front has a slight gather in the center. No science here, but we did allow for 2 inches of gathering in the waist measurement, so keep that in mind. Sew a stitch across the gathers to hold them in place. Now, right sides together, sew the skirt front to the skirt back at the side seams. As you can see, you will be sewing the skirt back to the side of the pocket near the top. 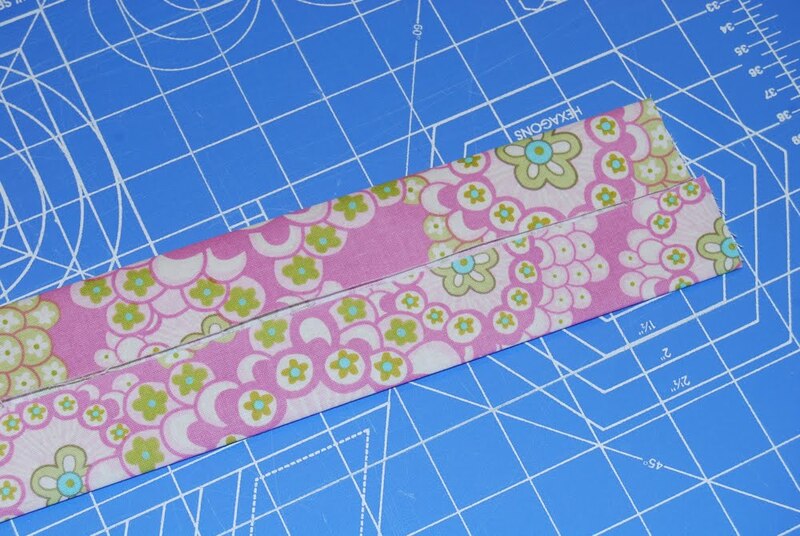 Now fold your waistband lengthwise, right sides together, so the ends match up. Take no note of the different fabric used in the pictures below, and please don’t assume that this was necessary because I did this part wrong in the making of my own tutorial, which I had also already made once before. Thanks. Now comes the part where you will need to wrestle your screaming toddler to the ground to obtain their back waist measurement. Because your toddler will be flailing and most likely hop around and catch you under the jaw with their thick skull (don’t you hate that?! ), it is not necessary that this measurement is scientifically exact, but you should try to get as close as possible. You’re just measuring from one side to the other, ie: half their waist measurement. You could just use half their waist measurement, but I find that their little frog bellies make it so the back waist is actually less than half. Cut your elastic to this measurement minus 1 inch. 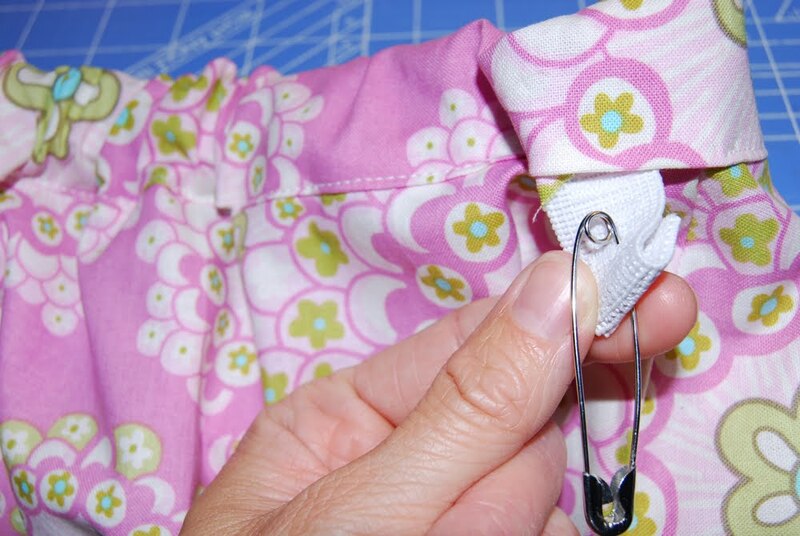 Hook a safety pin through one end of the elastic, and lay the other end over the bottom half of your folded waistband. Pin in place. 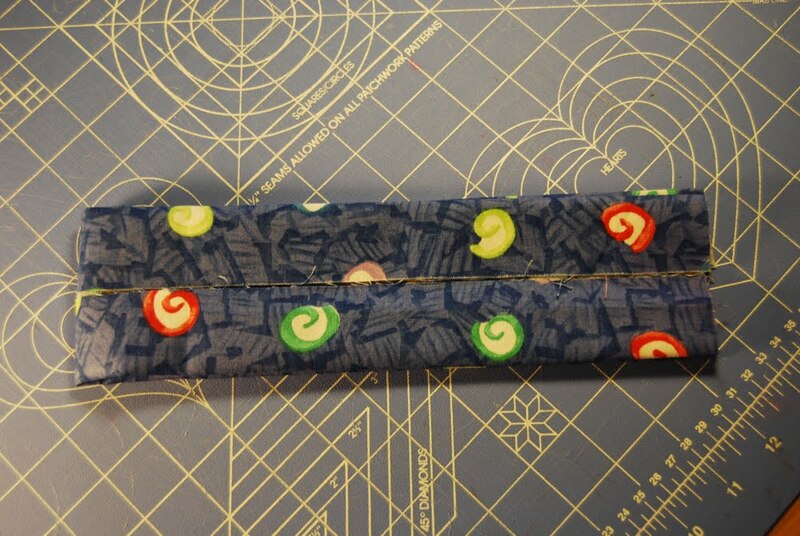 Then, using a 1/2 inch seam allowance, sew the ends of the waistband and the elastic together. You may want to go back and forth over the elastic to make sure it is good and in there. Now you will have a circular waistband piece will some elastic dangling out. Line up the seam in the waistband with one of the side seams of the skirt and fold the waistband over, sandwiching the skirt top. Make sure the elastic is enclosed between the outer waistband and the outside of the back of the skirt. 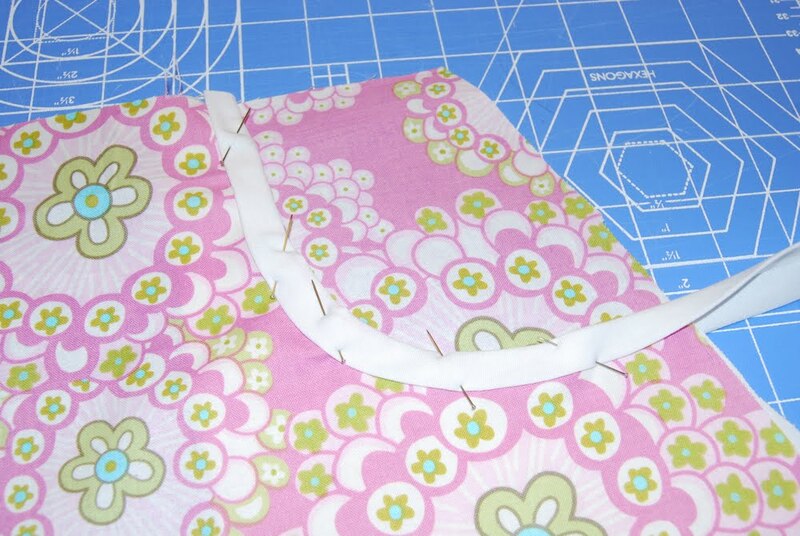 Pin like crazy and use your same happy stitch setting to topstitch as close to the edge of the waistband as possible. You will need to leave an opening on the skirt side seam so you can pull the elastic out. 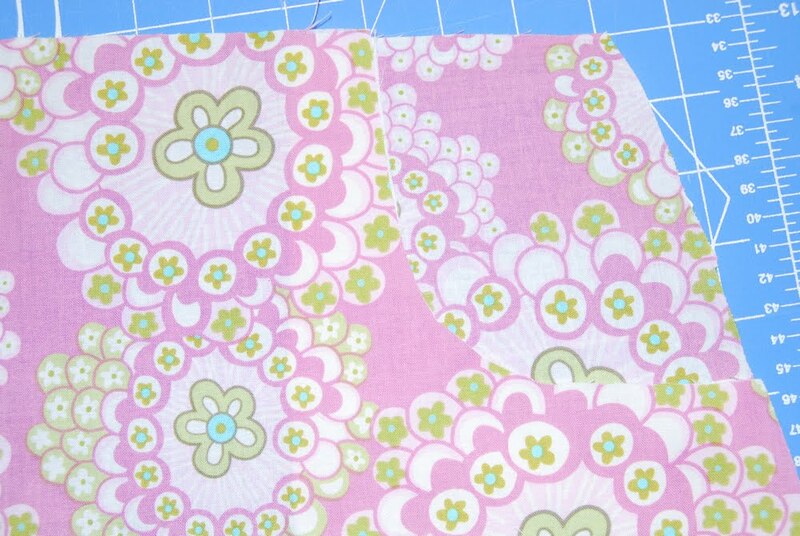 This will be on the opposite side of the waistband seam. It is ok to sew the elastic into the waistband casing because you still have your friendly little safety pin to guide it out. Once you have sewn all the way around except for the small opening, find the safety pin and start pushing it through to the opposite side of the back of the skirt. Pull it out and carefully unpin the safety pin without losing the elastic. You will need to push the elastic back into the casing, making sure there is at least half an inch overlapping the side seam of the skirt. If you value your time, don’t lose your elastic, or you’ll become intimate buddies with my other friend, the seam ripper. 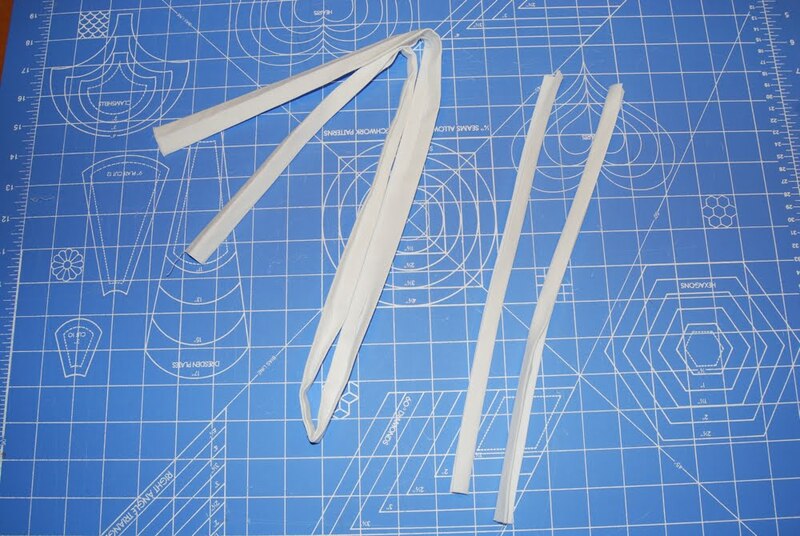 Once the elastic is in place, use a straight pin to make sure it stays put. Now, topstitch vertically down the waistband, catching the elastic inside, until you reach the side seam of the skirt. Again, you may want to go over this seam a few times to make sure the elastic is secure. Then close the small opening you left in the waistband. 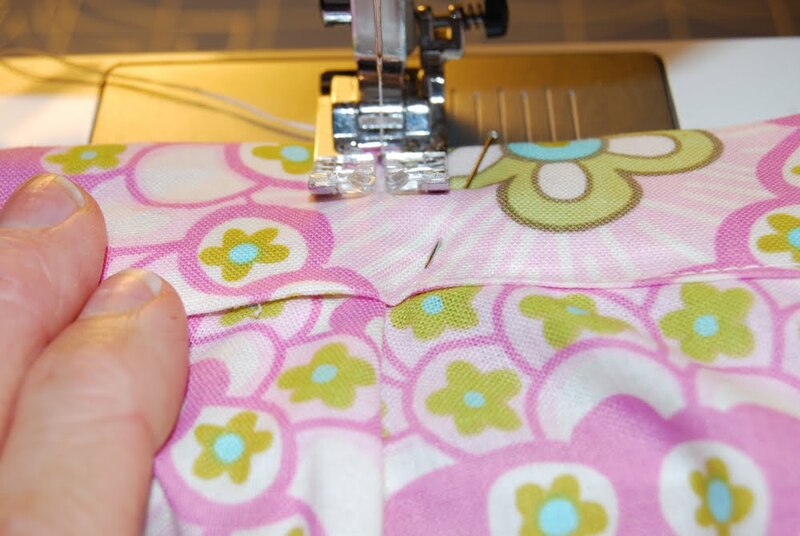 Now, if you’ve decided to use the bias tape to hem, just attach the tape like you did to the pockets and sew around, finishing the same way you would when doing quilt binding (sewing right sides together on a diagonal). I won’t reinvent the wheel, but if necessary, you can find a fabulous tutorial for this on Heather Bailey’s website (under “tutorials” – “bind a quilt”). Otherwise, just hem the skirt as usual, and you are done! Congrats on finishing the skirt and making it all the way through my very confusing amateur tutorial! I used Amy Butler quilting cotton for this set, but I think this skirt would be even better with a lighter fabric like lawn or voile (just add a lining and skip the bias trim on the hem). Or, make it winter-friendly by using corduroy, denim, or velveteen. Use your imagination! Have fun! When you’re done, add pics of your finished product to our flickr site! i love this skirt! thanks for the tutorial. i can’t wait to make one for my little girl. Ooh – I will add this one on my list! Love how it turned out! Thanks for the tutorial. I can’t get over how cute that skirt is! I love the fabric! i love this skirt! to bad i have three little boys…maybe a mom version is in order! It didn’t stay on my list very long… I have one completed! LOVE this skirt – i have stayed away from pockets because they scared me – seemed simple enough, but never worked out, I will try again – thanks for the inspiration! I agree with a lot of what you’re saying here but it could do with more detail. They stayed away in droves. This is so stinkin’ cute!! Love this tutorial! Thanks, from one crafty mom to another! My sister and I just started a crafting blog as well. I love yours. Thanks for this tutorial, it was great–even better, you made me laugh! And that, on an early Monday morning is priceless. I found your site through CraftGossip and I love it!! There are so many tutes! :) Good luck with the blog ladies! Hi girls, your tutorial looks great, I will keep on following you. I love it! Thanks for posting. I found your site from Grosgrain and Ruffles and Stuff. I’m a mom of 3 kids, 2 girls and a boy (4 1/2, 3, 17 mos). I love your blog name and I can totally relate to it. Thanks for inspiring the creativity in all of us! What a gorgeous little skirt! I will try this one, thanks! And I do appreciate a tutorial that factors in some toddler taming! Loved it immediatly! Made one immediatly last night! My daughter is very happy with her new skirt. I skipped the gathering and made some pleats on the front. I posted some pictures on flickr. love your site. 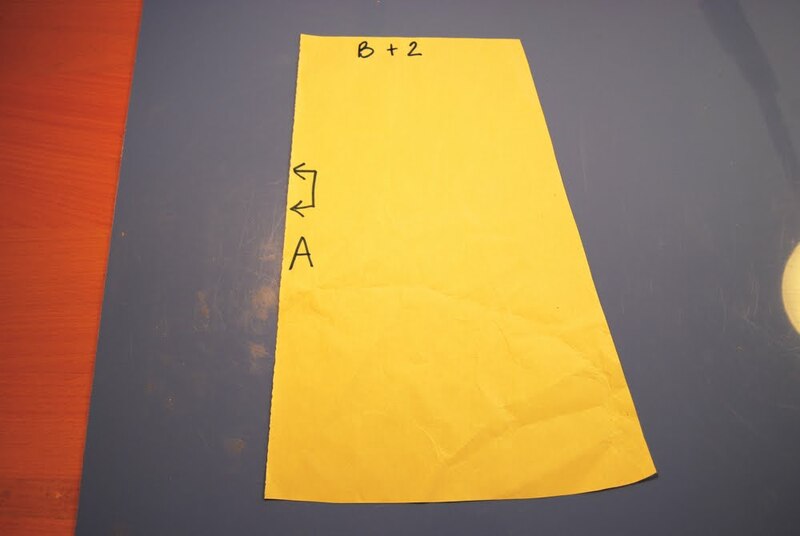 May I use the picture of the skirt tutorialed to show an example of how to do a bias binding? I am reviewing sewing machine feet. I will add a not identifying the source that means you and your site. What a darling skirt! I found your blog through Ruffles and Stuff…so glad she pointed you out. I made 2 of these skirts this evening for my daughters. They were so easy and I did not have to use my seam ripper once…must mean your directions were perfect!!! Thanks so much! Well we made our patterns and have finished 3 skirts today. I will be posting them on my blog, Shepherdsfold tomorrow as the girls are to tired to do photos tonight. I have a serger which made it come together so quickly. This was so simple and so cute, thank you does not seem adequat. I am very grateful to all my Sister in the Lord who sacrifice there time to share with all of us. Thanks for the tutorial. I’ll try it in a few days! oh my goodness I just learned something. 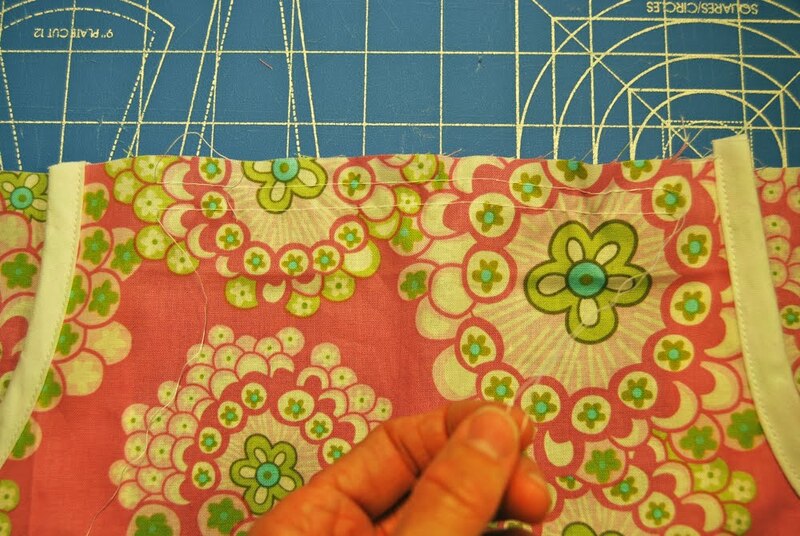 what a great tip about sewing w/ the needle all the way to the side for bias trim. Great tutorial! Can these instructions be used for a mom size skirt too? This is exactly the pattern I have been looking for everywhere so thank you so much for your tutorial!! We’re heading into winter in the Southern Hemisphere so I am going to make it in denim or courdoroy. I’ll let you know when I do it. Thanks again. little girl, shmittle shmirl! I want one for me! And yay for me having all boys so I don’t have to feel guilty about that. Now that I’ve got the pattern drafted, my mind is busy thinking up new fabric combinations. Thanks for the great project! I think this is the cutest outfit ever. If I had a little girl, I would make this for her. Is there anything you’d do differently for an adult skirt? I bought some material yesterday for myself (Walmart clearance! ), and I think this skirt would be GREAT for it! I just wanted to check with you before I start cutting…. Hi Sara, I hope you see this, I couldn’t find another way to respond. If I personally were making an adult version, I think I’d make sure to use a fabric with a really good drape (ie: no quilting cottons or anything stiff like that). If you fabric is not very drape-y, maybe cut the side seams so the skirt is more straight than a-line so it doesn’t stick out weird. Also, I’d probably skip the bias tape around the pockets and hem, as that makes it look a bit childish, in my opinion. But that’s just me. 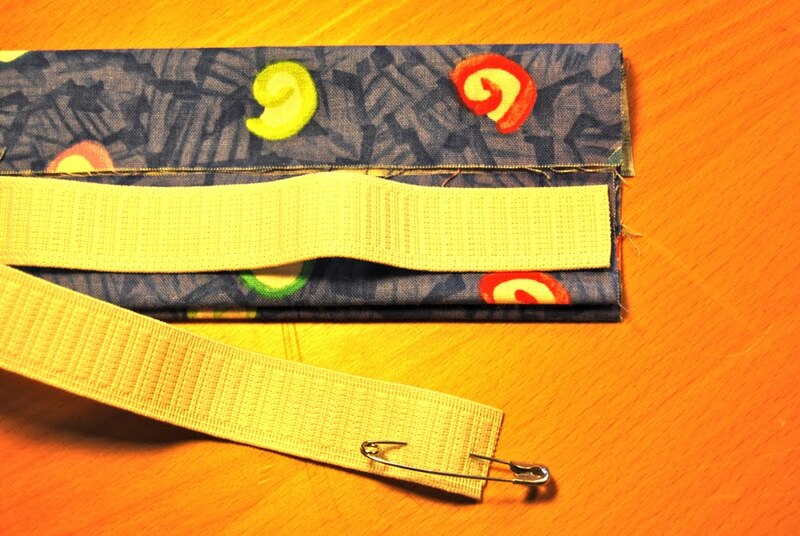 If you’re comfortable with it, I’d probably make a zipper closure on the side or back instead of elastic too. I’ve had about 4 other people send me pics of their adult versions, and they were all great, so you should have luck. My favorite was the one made with a soft linen/cotton blend. It really hung nicely and looked store-bought. Just my 2 cents! I have wanted to make this skirt since I first saw the tutorial right around when my daughter was born (I really hoped she’d want to collect rocks in her pockets). I finally did it today and I just love it. Thank you so much! Thank you for your directions. i actually made this skirt in a mom size and it is perfect. 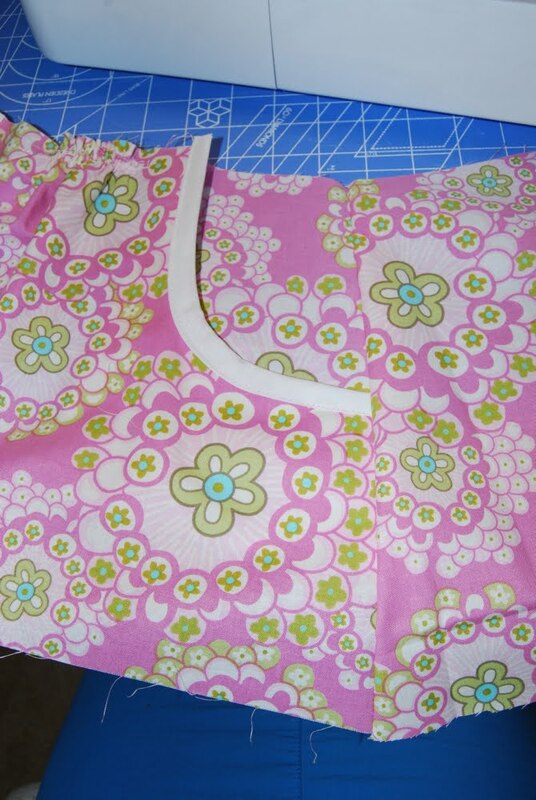 i did my bottom width of the skirt +4 inches from the top width on the front and the back pattern piece. I am using a 1 1/4″ elastic and this skirt fits perfect. Do I add the 2 inches to the front or the back? the tute said to the back but after I cut both pieces out and read on down step by step the additional 2″ should have been added to the FRONT where she put the gathers… I didn’t put 2 & 2 together till I … Put it together 😕 my back pattern is 4″ too wide and my front doesn’t have enough material to gather and still fit, thankfully I have a little more material though. I just finished my little version! Hopefully I can get the girl to wear it for Thanksgiving. 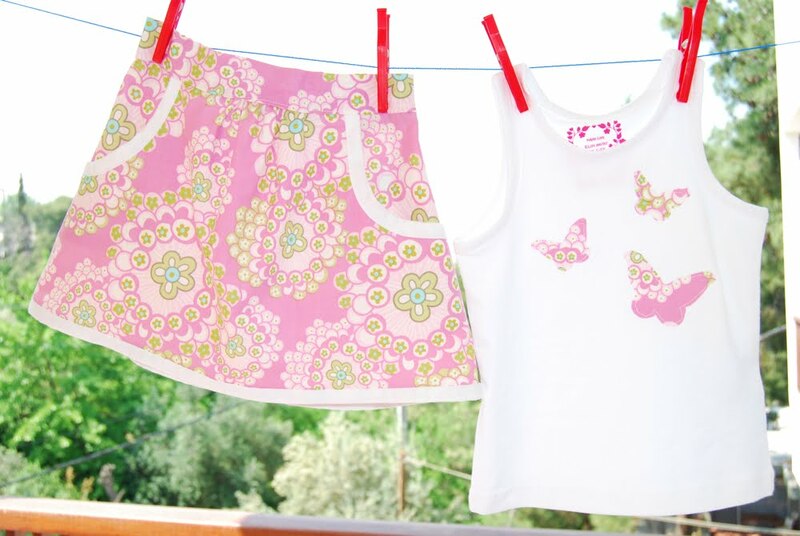 Thankyou for the clear (and amusing) skirt tutorial – have made one for my 3 yo daughter this Easter :). Don’t know how to post links to photos but I made it in dark denim with printed lilac cord binding on pockets and hem and cord waistband too and it looks great (it’s autumn over here in Australia). I like your half elastic method – it worked well. Thanks very much :)! This looks good, thank you. May well try it for my 6 year old. The skirt looks great and i love the blue fabric from the first Picture. Could you tell me the name of this fabric? Thanks very much! It’s Erin McMorris’ Park Slope! What seam allowance do we use? Thanks so much for sharing! This has been on my “one day” list for a while now but I finally completed one. It was easy to make with clear instructions. Thanks again. I’m in the process of making this for my 5 year old daughter! Be cut it all out now I’m pinning for sewing and we shall see where this new adventure takes us ;) thanks for posting!